CrateDB ships with a web administration user interface (UI), or admin UI for short. 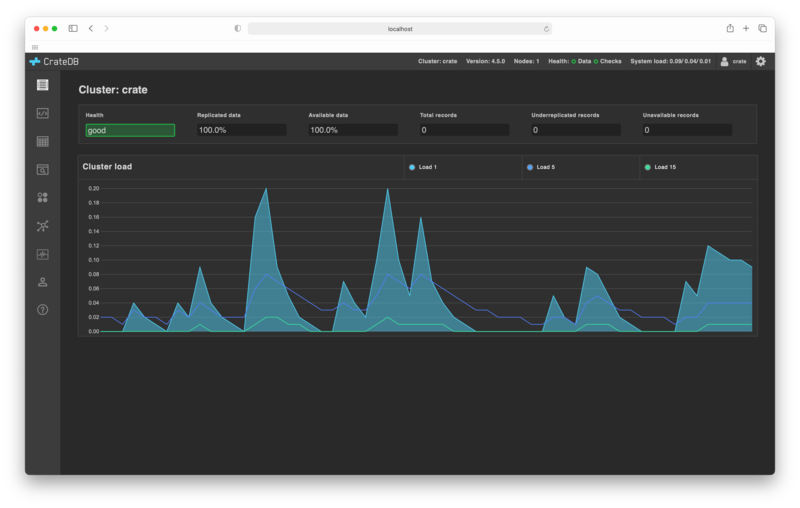 The CrateDB admin UI runs on every CrateDB node, and you can use it to inspect and interact with the whole CrateDB cluster in a number of ways. The CrateDB admin UI is an open source project and is hosted on GitHub. Here, replace HOSTNAME with the hostname of the CrateDB node. If CrateDB is running locally, this will be localhost. If port 4200 is accessed via a client library or command line tool like curl or wget, the request will be handled by the CrateDB Rest API, and the response will be JSON. This is the standard theme. The community edition of CrateDB uses a lighter theme.